Hi there! If you're looking for the Creative Scrappers blog hop, you are in the right place and if you are one of my friendly loyal visitors who is stumbling across this from my blog, today might be your lucky day! I'm taking part in the Creative Scrappers blog hop. We will be showing off some of our favorite Creative Scrappers Sketches and Layouts and not only can you participate in our hop but you have a chance to win a Creative Scrappers ebook of Sketches "Creating with Sketches" by Kristine Davidson. I created this layout of my daughter and her grandfather aka my dad. We call him Big Daddy. That's what I called my dad's dad and since my dad is a Jr., it was most fitting that he be a Big Daddy too! Anyway, we found this fun crazy hair hat and gave it to him as part of his Father's Day gift. He and Rheagan had a great time playing with hats and I was lucky enough to capture a few of them with Instagram! Supplies: Scrapbook Circle June 2012 Field Notes Kit: Crate Paper Story Teller Archives, Studio Calico Abroad Continental, Studio Calico Abroad Boarding Pass, My Mind's Eye Caroline Curious Planks, Simple Stories Documented Chevron, Echo Park This & That Numbers, Echo Park This & That 12 x 12 Alpha Stickers, Bella Blvd Teal Washi Tape, Jillibean Vacation Soup Label, 7 Gypsies Travel/Date Stickers, misc star punch, misc circle punch (3 sizes), Janome sewing machine, Imaginisce i-rock & glam rocks, Mr Hueys Mist in Bonny Blue & Calico, Bazzil Tape Runner, Zig black pen in .5mm. 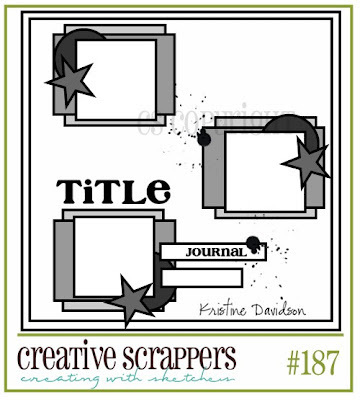 Creative How To: I used Creative Scrappers sketch 187 by Kristine Davidson. I created 3 little stories on the page with layers of paper and embellishments. I strategically placed certain words, like "misdirected", "historic landmark" etc around the photos. I then misted over the papers, punched stars and 3 different size circles. I splattered them out on the page and when happy with where they landed for the most part, I on;y had to move a few of them around. Journaling reads: A classic case of the sillies with Big Daddy on Father's Day 2011. Leave a comment here on this post for your chance to win the ebook of Sketches that I am giving away on my blog. This is a separate then the giveaway from Creative Scrappers and all the other gals you'll "meet" on the hop. Next, hop around to the design team blogs for a chance to win more goodies and increase your chances to win an ebook offered by each of them. Once you are done with the hop, please leave a comment and a link to your blog on our main Creative Scrappers Blog Hop Post. This ghope ends on September 8 and winners will be announced on Sept 10. Follow my blog to be entered into my 500 followers giveaway! When I reach 500 followers I will randomly select a few winners from my follower list to get special RAKs from me! This will include random assortments of paper, stamps, alphas, embellishments or whatever I am in the mood to throw in the package. Some will be new and some will be "vintage". LOL To enter and become my newest follower just click "Join" in the upper right hand of my blog under my photo. This giveaway ends when I reach 500 followers so check back often. Winners will be announced on my blog. You don't have to become a follower to be eligible for the Creative Scrappers ebook giveaway! 3. Heather Leopard <--That's ME! I hope you enjoy the hop! You have until September 8 to leave your comments with winners being announced on the Creative Scrapper blog on September 10th. Now HOP on over to Juliana's blog!! Good luck and thanks for stopping by today! O realy luv your style and the sketch you choose is One of my favorites!!! Luv this Heather!!! You worked that sketch perfectly!!! oooh Your prize book would be AWESOME to win. I can just imagine all the great sketches!!! Thanks for being part of the hop! Great take on the sketch - I love the use of 3 photos of Big Daddy! Love your style, blog and projects - beautiful! I love this sketch and your interpretation of it! So often I am trying to clump all of my pictures together on my layout so it is nice to see a different way of doing things. I will have to try this soon. love the layout!! great take on it!! this is beautiful, love it ! 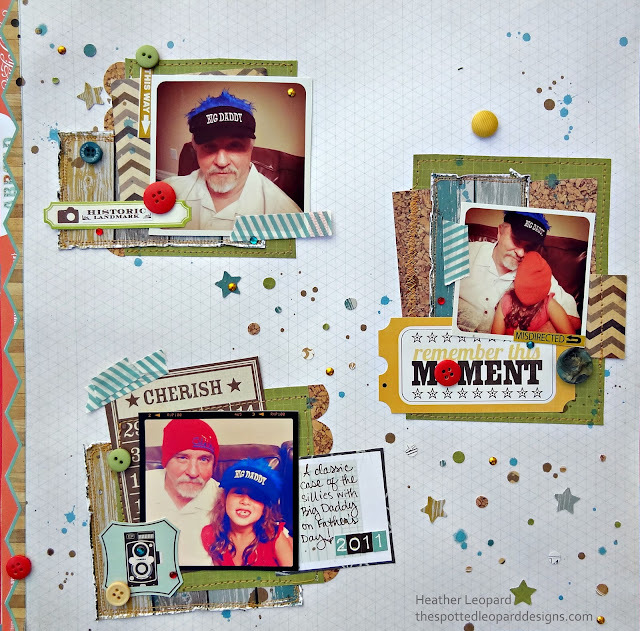 Super cute layout and pictures! Wow!!! Fantastic LO! Now following. Thanks! Got to hop on. Thanks! Love your layout Heather! That sketch is awesome!!! Such a great take on the sketch! I love caputring family moments! Awesome take on the sketch, Heather! Love all of the confetti! Wow! That's a really fun page with those stars!! I love what you did with this sketch!! Absolutely fantastic!! Amei seu blog, vim através do blog hop e me tornei sua seguidora!!! Really do love your style! Each one of your layouts have been my favourite! Just followed your blog (can't believe I hadn't already!) and was number 497, SOOO close now! Great page! I loved it! I am a new follower! Number 499! you are sooooo close! Heather, following true artists is a pleasure. Thanks for sharing your creativity. I love how you used that sketch to your advantage Heather and made three little story boards! Great layout! OH my! I'm follower #501! LOL! BTW, love your layout esp the confetti! You did amazing with that sketch! Love it!! TOTALLy cute pictures! Love that your dad has such a great sense of humor--GREAT page!